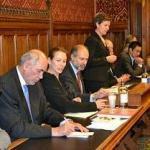 On Monday 14 November, at the Houses of Parliament, the « Labour Friends of France » was launched by MP Fabian Hamilton ,joined by representatives of the French socialist party. A number of such initiatives are being launched across Europe, with various left wing goups seeking to rally and strengthen their positions for the next elections. Similar initiatives are also taking place in Germany and Italy. « It is the entente cordiale of the left! » was the view expressed by those attending the event in London. This is now ancient history, with the recent economic crisis having changed the political order again and both the French Socialist party and the Labour party now in opposition in their parliaments. Mary Creagh, Labour MP, pointed out that « during difficult times, it is essential for political parties to be united and define together the real challenges of Europe ». In a relaxed atmosphere, the socialist speakers talked of their success in the French primaries and their victory in the senatorial elections. Can we see these successes influencing and inspiring the British left ? The debates certainly showed a real will to cooperate. All the speakers asserted their thirst for political renewal and their desire for change. They are now ready to campaign together in order to be stronger and achieve their dream of a left-wing Europe. According to the Parisian socialist MP, Christophe Caresche, this dream could be realised in 2012 because « in recent years the socialist movement has matured and now represents a real hope for people in Europe ». Axelle Lemaire, socialist candidate, hoping to become the first MP representing French people living in Northern Europe at the French Parliament, concluded the event by underlying the importance of defining common answers to crucial issues such as investment in renewable energies, the role of finance and education. In closing the meeting she summarised : « This cooperation demonstrates what European citizenship really means ».